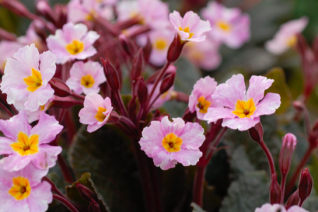 Good reliable perennial Primrose with dark maroon leaves and stems in great contrast to the simple lavender pink flowers. A nice yellow eye adorns the center of each flowers. Blooms February to early May. Low growing form that makes colonies over time in rich, moisture retentive soil with regular water. Must have regular summer water to survive the drought season and this one will without huge amounts of effort. Under shrubs in woodland glens. Easy perennial. The most vividly colored flowers of the three cv of P. sieboldii. Hot pink on the reverse of the heavily frilled petals with an open front of white with distinctive hot pink striations shot right through. Blooms in-between the other two selections. 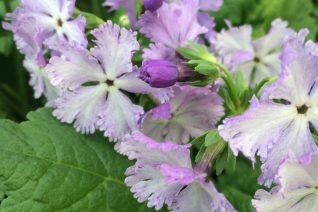 First ‘Late Snow’ then ‘Lacy Lady’ and finally ‘Ice Princess’ Plant them all together and you get an extended show of one of the prettiest and most sophisticated species of Primula. Goes quickly summer dormant with heat. Continue to occasionally water through the dry summer. To 8″ high in bloom. My personal favorite primrose. This sieboldii selection blooms later than others but the flowers which are soft blue on the back of the flower and have a pure clean white face on the front. Heavily frilled petals are elegant on 8″ stems. Blooms May to early June in cooler years. No other cv of P. sieboldii comes as close to true blue. 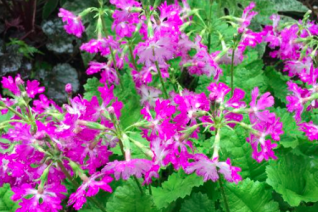 Forms a clump in time in rich, moisture retentive soil in part shade. Goes quickly summer dormant with true heat. Still water the roots of the dormant plant- they like that and will reward you with a greater show the following spring. 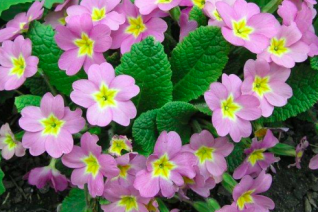 Excellent, selection of this easy and graceful perennial Primrose. Grass green round leaves form a rosette from the middle 8″ spikes support masses of flat, heavily frilled pure white flowers from April to late May. This is the most vigorous selection that we grow and will quickly increase in size in rich, moisture retentive soil in part shade. Blooms heavily for 6 weeks then goes quickly but quietly summer dormant. Though it has disappeared its important to at least occasionally water the plants roots through summer. To 1 1/2′ wide in several years. Apply a handful of all organic fertilizer in early spring. 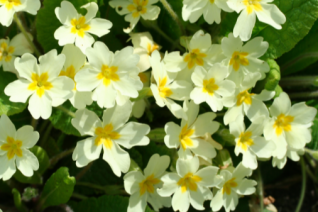 This is the wild primrose of Europe that lives in shady hedgerows and moist shady environs. 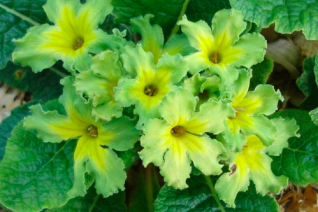 Its the soft yellow flower color for which the hue ‘Primrose’ got its name. 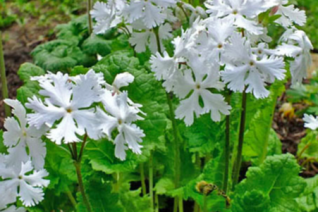 Smaller colony forming perennial for part shade to shade in rich, moisture retentive soil. Bloom may begin as early as February and eventually peter out in May. Pale yellow single fragrant flowers with a brighter yellow eye are more than cheerful in our wet gray springs they are a bright tonic. It must have regular summer moisture in order to survive our summer drought and if it does it will come back in winter bigger and more bloomier than ever. Bait for slugs.